Posted byMei 21 February, 2011 19 May, 2018 5 Comments on What Triggers Itch? 1. Heat and Perspiration 96%. Heat is the ONE thing that I’m most afraid of. Even in an air-conditioned restaurant where not-so-cold air comes out from only certain air vents, Marcie would scratch her neck out before we even ordered the meal. Don’t be afraid to walk into a restaurant and ‘feel the air’ and ask for the coolest seat. Sweat contains chemicals that may trigger itch, so keep your baby fresh all the time. Sudden changes in temperature or humidity may also be a trigger. 2. Wool 91%. Scratchy fabrics are to be avoided, including nylon and polyester, which may irritate the skin. Wear light cotton for your baby. 3. Stress 81%. Baby gets stressed too, so let your baby have a routine and keep her occupied with toys. I co-sleep with my baby as I feel it reduces her stress too. 4. Spicy food/ hot beverage 49%. I know this is going to be controversial – I give Marcie cold baby fruit juice from fridge. My parents and the infant care teachers freak out at this and blamed a lot of Marcie’s problems on cold drinks. But I know she’s happy and almost immediately stopped scratching and took her mind off the itch. When I’m out, I may buy her a cold drink just so she can hold the cold bottle (it works!). For the record, I read that the only negative impact of cold drinks/food is that the baby takes more energy to digest them, thus reducing the energy left for your baby’s body. 5. Alcohol 44%. Not an issue with children but don’t apply alcohol on your baby’s skin though it’s cooling when the alcohol evaporates. It may dry her skin further. Drinking alcohol is of course a no-no. It expands the blood vessels near the skin, causing the skin to be more sensitive. 6. Cold 36%. I’m not sure about this one – whether the cold triggers the itch or simply a baby with cold feels cranky and scratches. 7. Dust mite droppings 35%. Marcie is tested to be not allergic to dust mite droppings but I still steam her clothes and the bed sheet, pillow cases in hot water to kill the dust mite. (Please buy a good steam washing machine if you like to do this; boiling water yourself and soaking the clothes take too much of the little time you have). – Soap, perfume, laundry detergent. I use soap-free bath oil for Marcie, nothing she uses is perfumed and the laundry detergent is children-friendly. Plus my washing machine has an allergy function that washes off the chemical in the detergent thoroughly. – Chlorinated water. Bathe and moisturize after swimming, check out this post. – Pet fur. Marcie is tested not allergic to dog’s and cat’s hair. Do get your baby tested too. Plus pets bring in lots of allergens from outside the house, do keep them at least out of your baby’s bedroom. – Mold. Marcie is tested not allergic to mold too. Do get your baby tested. – Saliva. This is quite a common irritant for even non-eczema children. Baby’s cheeks and areas around the mouth usually get red with rashes due to constant contact with saliva, especially when they start teething and playing with their saliva! I use cool boiled water to wipe Marcie’s face before her bedtime. – Food. Though food is the most worrying for most parents, it is seldom the trigger. Marcie is not allergic to peanuts nor cow’s milk or egg, but the doctor’s advice is to wait till one year old to try these food. Mango is another fruit that many people balked at me for letting Marcie eat, citing that it is a ‘heaty’ food. I read somewhere later though that the area around the mango skin may cause itch, so just take care to let your baby eat the flesh inside. Mango is a very good fruit with vitamins, don’t ignore it and baby loves them with yoghurt! Final point – do a skin prick test. Don’t guess and drive yourself crazy. Thanks Stephanie, glad my blog helps! My toddler also has worse eczema when she’s ill – but I think that’s because of increased body temperature. I checked up on histamine release, I think that’s a possibility too, though I know it’s more common for hives. Maybe can consider reducing intake of histamine-rich food? Histamine-rich foods may include tuna, spinach, beer, wine and eggplant, according to the American College of Gastroenterology. Eating foods high in histamine can trigger mast cells to produce more histamine, leading to a severe eczema outbreak. I’ll bear your question in mind and ask a doc in my Fri Q&A 🙂 Thanks! 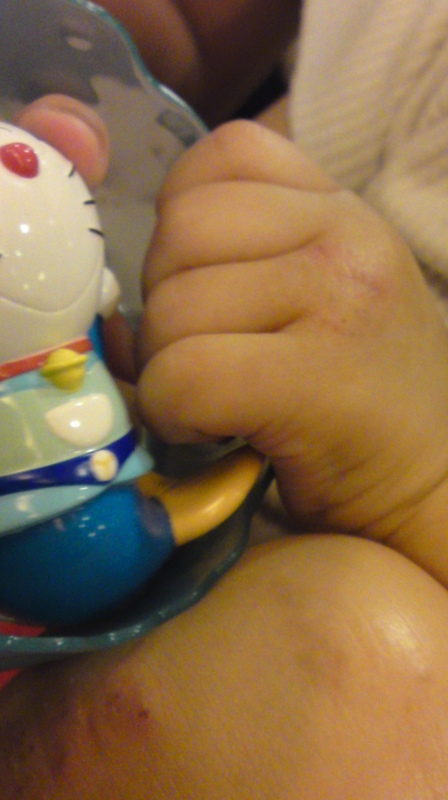 I notice that my daughter’s eczema is the worst when she has a cold. The scratching is everywhere, I assume from the histamine release during a cold? Though she is severely allergic to wheat, eggs, dairy, tree nuts and peanuts and reactions are often followed by days of eczema and asthma flares, the open wounds from scratching are really terrible during sickness. It’s so very stressful, but blogs like yours help immensely. I didn’t realize either until I started seeing so many kids almost being “cured” of their eczema once certain foods were eliminated. Many of the kids allergies showed up in test, but many did not. The only way we knew with Tristan was by doing an elimination diet/food challenge. It really saved us. Thanks Jennifer for sharing; it didn’t occur to me to test out if my baby is allergic to the common allergic foods. She’s tested not allergic to anything, so I assume she can eat everything, though I’ve been told by her doctor to keep her off peanuts til 3 years old. Read somewhere that for eczema/allergic child, keeping off peanuts till 3 years old may help to prevent a peanut allergy. Heat is a big one for Tristan – it gets him itching, as does food allergies. He reacts to milk, soy, gluten, tomato, corn, almonds, hazelnuts, walnuts, strawberries, and cantaloupe. I know most dermatologists don’t like to make the food allergy connection, but honestly, I don’t know one single child whose skin didn’t improve when removing at least one of the most common food allergies. Tristan only showed a positive reaction to the skin prick and blood draw with walnuts and hazelnuts, BUT I know he is allergic to the items as we did the elimination diet. Once we reintroduced the foods listed above, each one individually caused him to flare-up and or get crazy itchy. So, while doctors may not recognize these foods as a true allergy, they still cause his eczema to erupt. Detergents, even all natural varieties, bother him to. We have to use soap nuts. It’s the only thing that doesn’t irritate his skin. For the cold trigger – my guess is because when it’s cold, it’s dry. And dry air is hard for eczema skin for sure.